Summertime is a great time to hang out dockside at Oregon Coast port towns. You can watch the commercial fishing boats come and go and unload their catch of the day. If your family wants to be part of the action, crabbing for Dungeness from the dock is a great excuse to spend the day by the water. 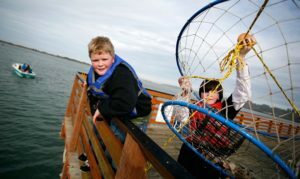 Dock crabbing is an easy activity for kids of all ages. Just rent a crab ring, bait, crab gauge (for measuring keepers) and bucket, and hit the dock. LeDoux recommends D Dock and B Dock in Charleston for crabbing. Bait the ring, toss it in the water and wait a few minutes. Pull up your line and see if you’ve nabbed a tasty crustacean that’s large enough to keep. “It’s kind of like playing the slot machines,” LeDoux says. Many shops on the coast, like Fishermen’s Wharf, will cook your catch for you. “We cook ’em, you clean ’em,” LeDoux says. Take your fresh cooked crab out back and enjoy a picnic while watching the activity on the docks. The best time to crab in the summer is one hour before high tide and up to one hour after. Check the tide tables at the National Oceanic and Atmospheric Administration website or with a local fishing supply store.